When you find yourself stuck on a rainy ‘summer’ Sunday afternoon, you’ve got two choices. You can either stay home and wait for the clouds to pass or you can go out and brave the storm for a slice of cake. And you know any option with cake is the right one. That's exactly what we did last month on a day out in Chester when we came across the super-cute Mad Hatters Tea Room. Located on the The Rows, this tea room's cosy setting and colourful display of cupcakes made it the ideal place to get out of the drizzle and indulge. On this occasion we opted for Harry's hot chocolate - with marshmallows and cream obviously - and a couple of rainbow sprinkled vanilla cupcakes. Absolutely amazing, the best cupcakes we've had in a long time and you can even buy some of your own hot chocolate to try at home. 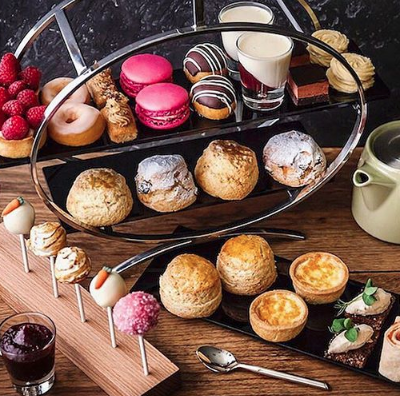 As the name may suggest, there are plenty of Alice-themed accents throughout for any Wonderland fans out there from the special Afternoon Tea names to the rustic menus - we will definitely be back soon to try The Red Queen's Afternoon Tea (priced at £20pp). The Mad Hatters Tea Room is open 7 days a week. For more info and to check out menus visit their website. I love anything Alice in Wonderland, these sound dreamy! How does it compare to the overrated Richmond Tearoom?